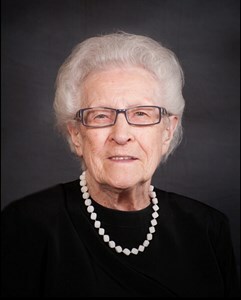 Jane Louise (Kruger) Brubaker passed from this life to eternal life with Jesus on January 22, 2019. She was 102 years old. Louise was born October 8, 1916 in the family farm house in rural Elmont, KS to Charles and Carrie Kruger. She married Clayton L. Brubaker March 28, 1948. Louise had four brothers and two sisters who preceded her in death: Charles (Jeff), Lawrence (Mutt), Alfred (Fritz), Donnie Kruger; and two sisters Ora (Kruger) Martin and Bessie (Kruger) Woodard. Louise and Clayton have two children: Linda Brubaker Pink (husband Clarence) and Ken (wife Eunice); three grandchildren: Lisa Pink, Lori Anderson (husband Bryce) and Leslie Pink (fiancé Danny Kalkhoff) and three great-grandchildren: Brady Anderson, Brendan Anderson and Logan Pink. Louise attended Golden Rule (a one-room schoolhouse) and Seaman High School. She moved into town and did housework for several families, worked in Snetigers Cafe and laundromat before beginning her career at Southwestern Bell Telephone Company where she retired in 1979 with 35 years of service. Retirement meant more time to help others and she immediately began volunteering at Santa Fe Hospital and St. Francis Hospital for the next 12 years. At the young age of 75, she began another 18 year career managing a Meals on Wheels location and serving meals daily for the Red Cross here in Topeka. Louise always made time to follow her favorite sports teams-attending whenever possible. From the Topeka Owls farm team to current day KC Royals, she knew all the players names and kept their stats. She also enjoyed and faithfully followed the Oklahoma University men’s basketball team. She has been a member of the Church of the Nazarene for 84 years, recently a member of Water’s Edge Church. The church has been a vital part of her life - attending services whenever the doors were open. She served as a Sunday School teacher and a delegate to denominational assemblies. Her legacy is shaped around her love for her Savior Jesus Christ. Her devotion to Christ was evident to everyone she met. Her strong commitment to God, family and friends will long influence those who knew her. Funeral services will be 1pm Saturday, January 26, 2019 at Parker-Price Cremations, Funerals & Receptions, 245 NW Independence Ave, Topeka. Burial will follow at Prairie Home Cemetery. A reception will immediately follow burial at the Parker-Price Reception Center, 1940 NW Central Ave, Topeka. In lieu of flowers, contributions could be made to Water’s Edge Church of the Nazarene, 10000 NW Prairie View Dr., Kansas City, MO 64153. To share a memory of Louise or leave a message for her family, please click the Share Memories button above. Add your memories to the guest book of Jane Brubaker. Louise was a such a beautiful person, inside and out. Her love of Jesus radiated from her life; in words and actions. She was such a role model for me and I am blessed to have had her in my life. I have so many rich memories of her in our younger years. She was truly a woman of God. Thank-you God for Louise, and thank-you that this is not good-bye; but simply "until we meet again." I’m so very sorry that I never had the privilege to meet Louise. Listening to Leslie talk about her grandma with such love in her voice was always a joy. And Danny always talked about her youthful teasing, and the enjoyable time they all spent together. It is so difficult to lose a loved one and I’m sorry to hear of your lose. I’m keeping all of you in my though and prayers. May your memories of your mother and grandmother, and your faith in our loving God and Jesus, help to heal your broken hearts. Linda so sorry to hear about the loss of your Mother. I know she will be missed. Prayers for you & your family. Linda, you and your family will be in our prayers. Your mother leaves a wonderful legacy of Christian devotion and service. Louise was a great lady. Heaven must be rejoicing upon her arrival. She was a wonderful example and will be missed by many. Praying for you all. Our condolences to the Brubaker family in the homegoing of Louise. Helen and I have fond memories of Clayton and Louise as we pastored the Fairlawn Church of the Nazarene from 1984 to 1994. Clayton and Louise were a vital part of our church during that time. Our love and prayers are extended to the family! I have never met your mother. However, I did want to say, after reading her obit, she certainly left a wonderful legacy of sharing Christ's love in many ways, such as giving up 'her' time to help others. May your family be comforted at this time.